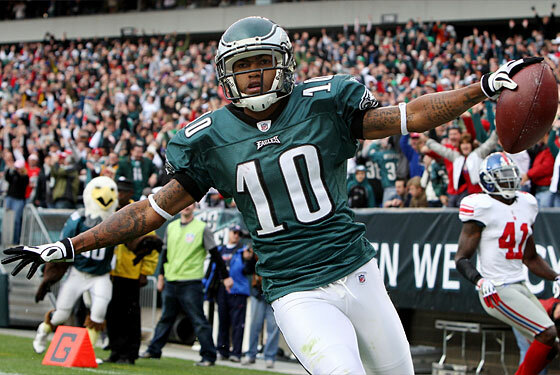 DeSean Jackson flies like an Eagle. It's hard to pick out an absolute worst moment from yesterday's Giants-Eagles game, mostly because there were so many to choose from that they all sort of blend together. Chronologically, there was Leonard Weaver's 41-yard touchdown run on the second play from scrimmage, or the Eli Manning interception that followed, which led to another Eagles score two minutes later. There was the DeSean Jackson touchdown on the first play after the Giants cut the lead to 16–7, and the Manning interception on the second play of the subsequent Giants drive, and the Jeremy Maclin TD just two plays later. And that's just the first half — we haven't even gotten to Domenik Hixon fumbling the second-half kickoff return. The point is, this game was ugly, and it's the third straight ugly game the Giants have played. In at least two of those three games, they barely showed up to play at all. This one was a real team effort, at least: The defense was pitiful (for our money, Jackson's second-quarter touchdown was the most embarrassing play, by virtue of how incredibly wide open he was), and the offense wasn't any better (though Kevin Boss had a nice enough game, we suppose). The Giants can maybe survive one aspect of their game malfunctioning at a time. (The passing game, for instance, picked up the running game early in the season, and the defense should be able to make up for the occasional day when Manning's not at his best.) But right now, nothing's working. For a few weeks, when the Giants were beating up the worst the NFL had to offer, the question surrounding them was something along the lines of, "How good are they really?" That question has changed, now that they've struggled mightily against three good teams. Now the question is, "Could they really be this bad?" Just asking this after week eight isn't good. But providing the sad answer on what's starting to feel like a weekly basis is worse.